Not the best Steam Workshop model, but damn does it sum up my idea incredibly well. By M-NINJA. aabicus: As someone who loves the Grenade Launcher but wishes he had more survivability, this very simple setup (that should remind you of a current TF2 weapon) has been my favorite stat concept I’ve come up with. We’re going with Clear Shot for its name only because my suggestion was a little rude. In my opinion, it holds an attraction for all brands of Demoman. Sticky Launcher demos can use it to regain health if they get the opportunity, demoknights and Sticky Jumper demos have to trade off a lowered damage output for survivability. And, the downside helps reduce pipe spam, something I’ve seen a lot of TF2 players complain about. Not too different from the stock Grenade Launcher, but the stock Grenade Launcher is awesome so why would I stray far from it? Medic: Why does no one tell me about these? Oh well. Anyway, the perfect weapon for me? The Bit of Everything is a Medi Gun my sibling and I came up with a while back. The whole idea behind it is that it does what the Kritzkrieg and the Quick Fix do but not as well. Most of you think it’d be overpowered or underpowered, but being someone who cannot make up their damned mind, this sort of thing is perfect for me. The Uber is weak, but since it’s healing multiple allies at once, that doesn’t matter. This is the sort of thing you’d use to make that one, big, final push towards victory. Of course, being an untested idea, it might be hideously overpowered, but we can always tweak the stats. I did consider giving it a split Uber bar like the Vaccinator, but I dunno, I think it’s good as it is. Model from The Survival Kit, by BANG! When in effect, teammates in the surrounding area will not consume clip ammunition or metal, instead using ammunition directly from their reserve. iGamr: I wanted to make a Soldier weapon, and while I was hoping for more than a simple stat-swap weapon, I couldn’t think of a good enough rocket launcher concept, so… a banner seemed like the next-best thing. The idea is that, once deployed, it’d allow classes with clip-based ammunition to fire continuously without reload. I’m not quire sure how much sense it would make (it’d only work on things with a reload animation; clip-based energy weapons would benefit, but not, say, miniguns or flamethrowers, and I have no idea how it would affect the Beggar’s Bazooka), but I think it’s could be interesting enough. Soldiers and Demomen would probably benefit the most from it, especially in combination with a Kritzkrieg, since no reloading would mean no time wasted. The Sniper’s primaries would probably operate similarly to an in-Focus Hitman’s Heatmaker, and the Cleaner’s Carbine would likely go well with this (moreso before the change from crits to minicrits as a bonus). 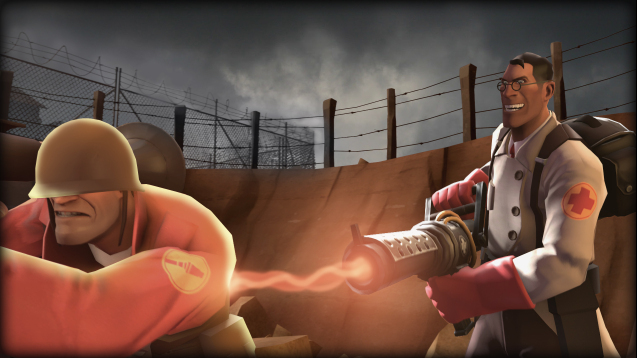 Pyros willing to stop spamming their flamethrower would gain some benefit, either with their shotguns or flare guns. Medics would, at the very least, get a bit of a bonus to their crossbow firing speed to top off a few extra far-off teammates in need of health. 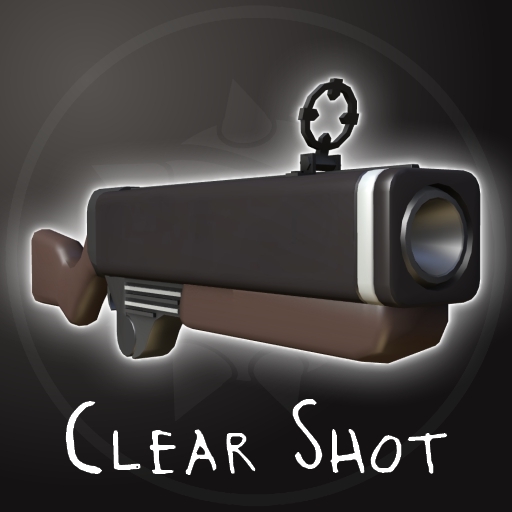 Heavies would probably benefit the least from it, as his shotguns seem to be considered a more niche choice than the team-healing Sandvich. I can’t imagine Scouts or Spies getting much use out of it, either, if only because they’d be too busy moving around to concern themselves with staying inside the banner’s radius. As for Engineers… I figured I’d throw them a bone in the way of stopping metal consumption, if only because it sounds like just enough to shake things up while still not being quite game-breaking. Banners only last 10 seconds, so it wouldn’t exactly let you set up a free nest of level 3 buildings, but it could still provide some sort of help on last-ditch sentry-saving efforts when metal supply is an issue, allowing for a few wrench repairs/upgrades when the metal supply is still low, or maybe some reload-free Rescue Ranger spam. Plus, I imagine it’d have crazy synergy with Engineer weapons like the Widowmaker, Frontier Justice, or (god help me) Gunslinger and Short Circuit. Hope that’s cool enough for ya!